The Series-19 is Lynx's highest grade porro-prism binocular. 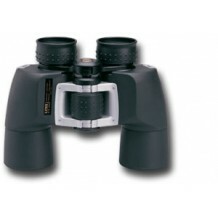 The black rubber covering over matte aluminium body sets this distinctive binocular apart. These models feature the best quality multi-coated lenses and BaK4 prisms housed in an attractively streamlined waterproof body, producing the best image quality of all Lynx binoculars. Porro prism design produces good perception of 3 dimensions. Multi-coated optics for maximum light transmission and contrast . Rubber armoured for improved ruggedness. Specifications: Model Power Objective FOV Weight Dimensions 19-842 8x 42mm 6.5° 690g 140x171x67mm .. Specifications: Model Power Objective FOV Weight Dimensions 19-1042 10x 42mm 6.5° 704g 140x170x67mm ..